Give kids some subtraction action! A basic, essential skill that all kids must possess, subtraction is a concept that is used in everyday life. 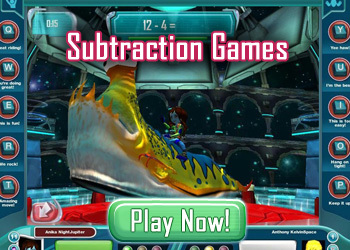 The cool math games in the virtual world here at Math Blaster include a variety of subtraction games. Players can take on fancy avatars and solve subtraction problems to gain points and move ahead! There are plenty of subtraction games for kids available online. Kids can choose from different levels to make their way from simple subtraction problems to tougher ones. Presented in an engaging and interactive manner, these online math games make subtraction more interesting and easy to learn. Subtraction can be taught to kids at an early age by integrating it in their everyday activities. It can be introduced to them during their play time by using their toys to indicate numbers. Taking away a few of their toys and asking them how many are remaining is a simple way of helping them understand this concept. Household chores, simple articles lying around the house, fruits and vegetables, anything can be used to explain subtraction to them. Parents and teachers must ensure that kids are able to solve simple subtraction problems before they move on to more difficult ones. A shaky foundation in basic addition and subtraction will make it increasingly difficult for kids to grasp other new and advanced concepts. The exciting math games in the virtual worlds at Math Blaster and JumpStart are a great way to get kids to practice math. Watch them hone their subtraction skills and become pros in no time!